Still waiting for an update…. I’ve been putting off an update for days (now turned into weeks), hoping that I would have a final diagnosis to share, unfortunately we are still waiting. 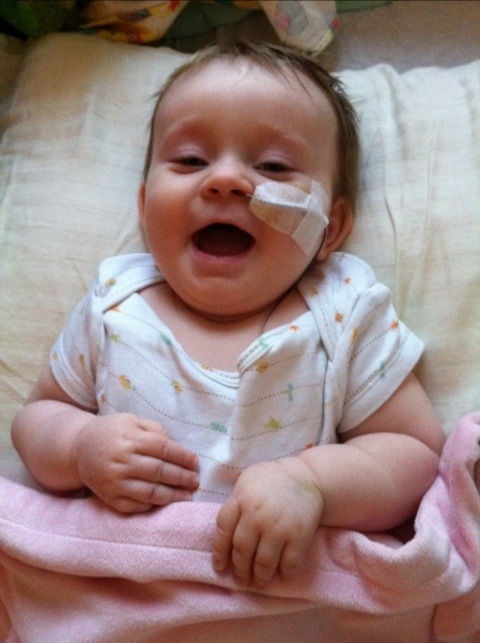 While in the hospital our lives changed quickly – news of Lauren’s condition kept coming in and pilling up, burying us. Now that we’re home no more news has come, and although I know that whatever does come is bad, I feel like we can’t officially start this new chapter in our lives until we have a name for it. Until then, lauren keeps doing small things every now and then like smile bigger than usual or let out a laugh that has me question the diagnosis. When I really look at her though I know in my heart that they are right, she has regressed so much already. Lauren is so beautiful, it’s very hard to come to terms with what is happening. Every day I wake up with one purpose, to make that little angel smile. Her perfect smile warms my heart and brings me to tears. Most mornings I cry, it’s harder to deal with this when I’m run down. She screams through a good chunk of the night, so sleep is hard to come by. I have to remind myself though that for now even though her motor skills are regressing, her mental skills have not. What a frustrated little girl she must be, being unable to do things that she mastered at four months old, I can understand her irritability. If you like to learn more about what Lauren is going through I have posted some links below that explain the two strains of Leukodystrophy that the doctors are leaning towards. Thanking everyone for their prayers, nice messages and thoughts. It is your support (our family, friends and community) that help us get through our days – Your words, gifts and meals are greatly appreciated. The past week and a half has been the most stressful and painful that I have yet had to experience. In a matter of days we were swept away from our old lives and ushered into a complete nightmare. Any glimmers of hope being snuffed out one after another – you know things are getting really bad when you and your doctors are actually hoping that your daughter has a brain tumor because the alternative is so much worse. 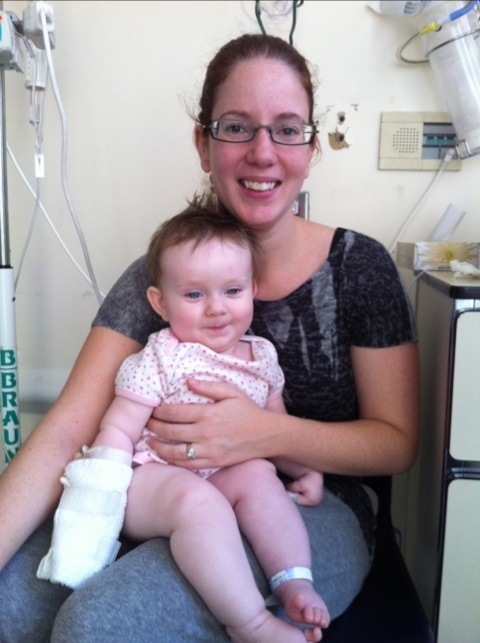 One thing that I was able to hold on to was my continuing ability to comfort Lauren, of which nursing played a big role. Nursing provided a moment of comfort for both Lauren and I and although I had been trying for months to transition her to a bottle or solids I was happy that I had been unsuccessful, we could still share these moments together. A week ago an occupational therapist had evaluated Lauren and discovered that she did not have a gag reflex. In a way this explained why Lauren had been so difficult to transition to solids. The OT mentioned that Lauren was probably refusing as a defense, preventing herself from chocking. Though this news seemed positive it came with more news, that I was not ready for. The OT told me that I should discontinue nursing Lauren as it could be unsafe and she could aspirate and develop pneumonia. At the same time a nutritionist had come to push us to use a NG tube to feed Lauren, ensuring that she would get enough calories. Through tear filled eyes I asked if I could continue nursing and top off with the feeding tube, the OT kept saying no, that it wouldn’t be safe. This was too much to take, Lauren had never showed signs of chocking while nursing before. More than ever this had become a really important way for me to comfort her and myself. Up until this point I had been in agreement with everything that had been suggested by the hospital, but this was breaking me. All I could think about was everything that Lauren was going through and I couldn’t bare to deny her this, especially if her life was going to be shortened. Thankfully the Pediatric doctors and my husband were willing to take my side and use my compromise. I would continue to nurse Lauren and then top off with the feeding tube… At least until we could test her ability to swallow and know for sure. Yesterday we had Lauren’s video fluoroscopy swallow test and she passed with flying colours. For now there is little risk to continue doing what I’m doing. 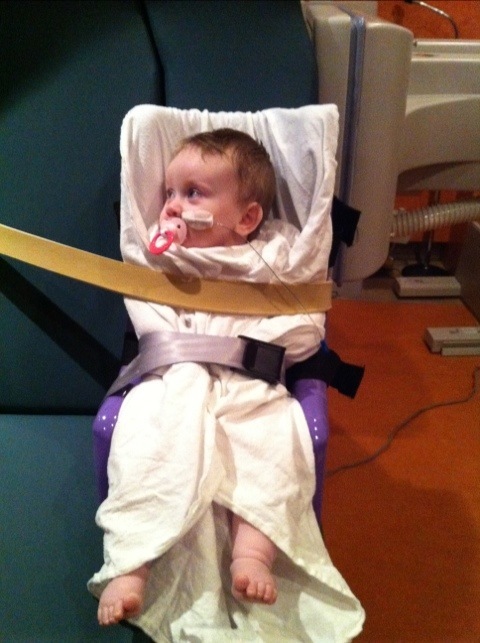 Below is a picture of our cutie strapped into to the chair for her Video fluoroscopy. It looks a lot more dramatic than it was, this test was easy in comparison to others. Like the CT scan the MRI confirmed that there were abnormalities in Lauren’s brain. The white matter appears to have degraded. White matter helps the signals in the brain to travel, this is why she is displaying a loss of motor skills. When we first arrived the Neurologists had suspected a brain disease and the testing that we have received back so far have continued to support this theory. the prognosis is bleak, the disease is incurable and progressive. 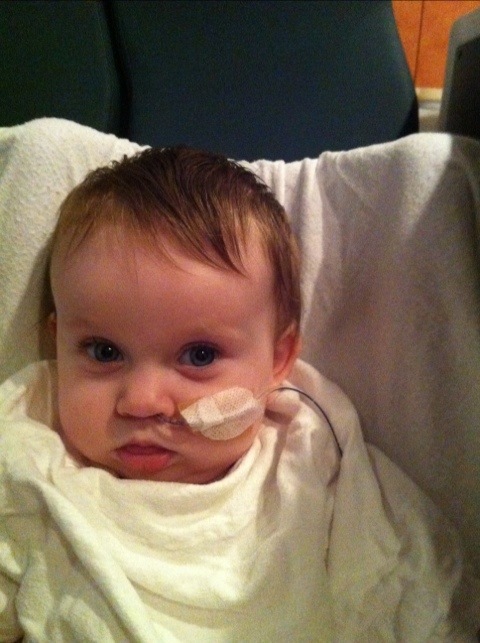 So far Lauren seems to be doing well, still smiling at us and trying her best to talk. Up until today that perfect little smile would send me into a convulsion of tears. I constantly ask myself how such a beautiful, perfect and “healthy” baby could be going through this. 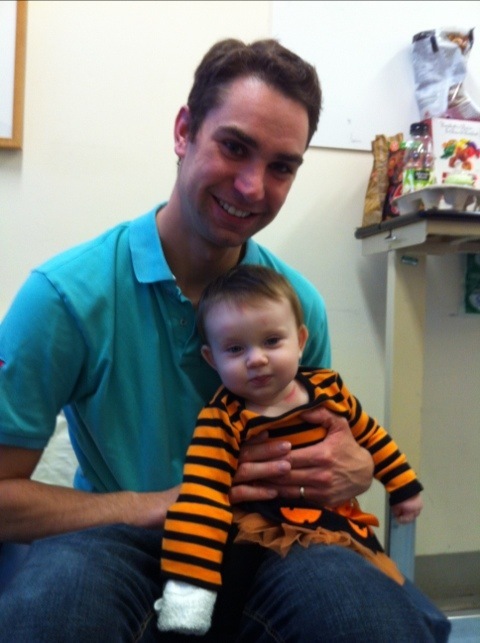 Since Lauren’s 6 month checkup she has not gained much weight or height. 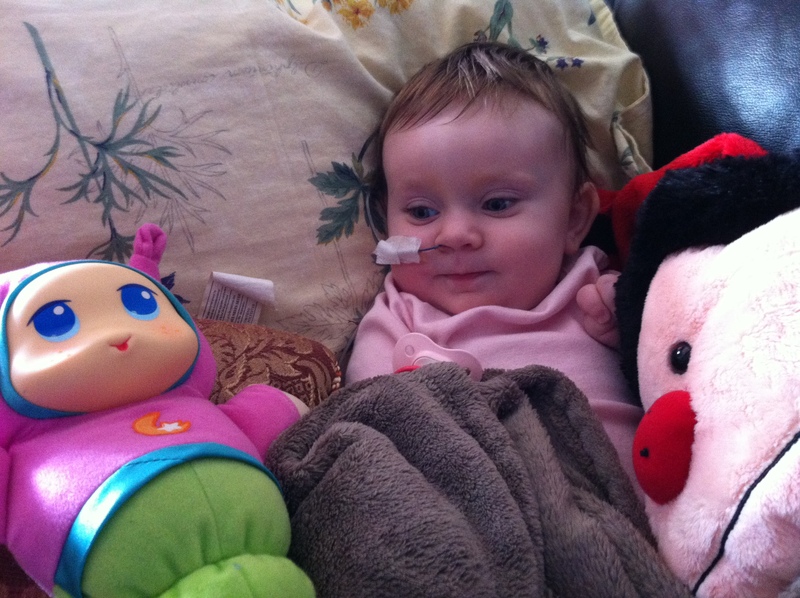 In order to ensure her strength the doctors have hooked up a feeding tube to supplement her regular breast feeding. I never in my life thought that I would ever need to learn how to operate on of those but I have to say its not as terrifying as it looks. At this point we want to thank our family and friends for the amazing amount if support and prayers and ask that you continue to keep Lauren in your thoughts and prayers. It has been repeated to me many times this week that God is bigger than any doctor or disease and that we shouldn’t lose faith. I will continue to pray and hope for more time with my angel. I wake up groggy in a hospital room, the reality of the previous days events come crashing over me, beating me down and pulling into a state of despair like a crashing wave. My princess is sick and mommy and daddy can’t help. Any strength saved from last night so that I could hold it all together is gone, tears burn hot on my face. I hold my sleepy angel and rock her back to sleep. 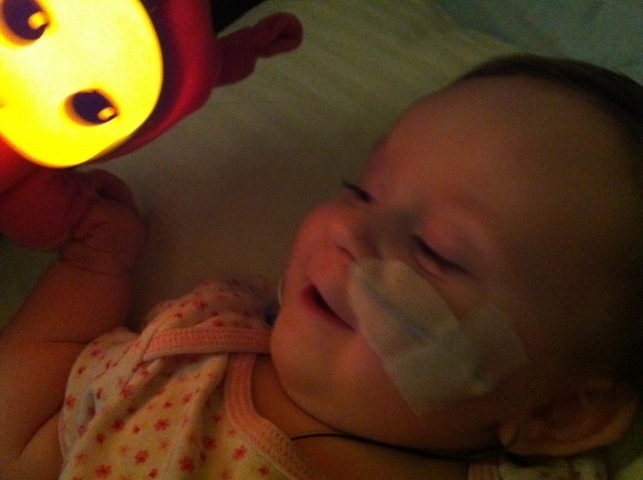 She is so perfect, beautiful and smart… But her body isnt working properly, her motor skills are severely regressing. In the summer (5- 8) months she was maturing beautifully, hitting every milestone that she was meant to, sitting, jumping holding her little head high. Today she is unable to sit, her head wobbles, she has a strong preference for her right side and her legs are often stiff. In one short month and a half she has regressed. The doctors think that her problem is Neurological. The first test that they do is a CT scan so that they can rule out masses (tumors), excess liquid and any apparent causes. On what I though was a positive note the test came back without anything major appearing that would explain Lauren’s condition. So far we have seen six different doctors all of which have noted down every detail of my pregnancy right up until today, we’ve been asked about illnesses in our family and for any details that we may have missed. 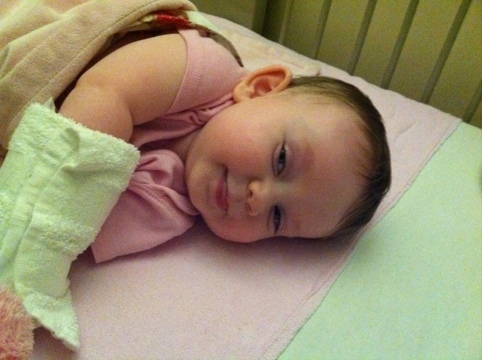 Based on what information has been heard the Neurologist thinks that Lauren may have a recessive genetic disorder. This would happen if both Stephen and I happened to have the same error somewhere in our genetic code. It didn’t come up in our cases because you need two errors for the problem to manifest. (I’m sure that this was a dumbed down explanation). There’s so many diseases that it could be that I don’t have the strength to even think about it right now, not before they actually figure out which one it could be. Regardless this news is not comforting, most of these diseases are not treatable and in some cases other milestones can go. I pray that there is another answer, some simple solution that has been staring us in the face that no one has seen yet. We have only started the testing and seem to have a big road ahead of us before we will have a better idea of what is going on. I ask you to pray with us for Lauren. At this moment there is nothing more important that we can do right now. We will keep posting her progress through our blog. A picture of our Princess smiling through it.